This entry was posted in Hurling, National League, Waterford, Waterford gallery and tagged Antrim, Walsh Park on 17/03/2015 by deiseach. 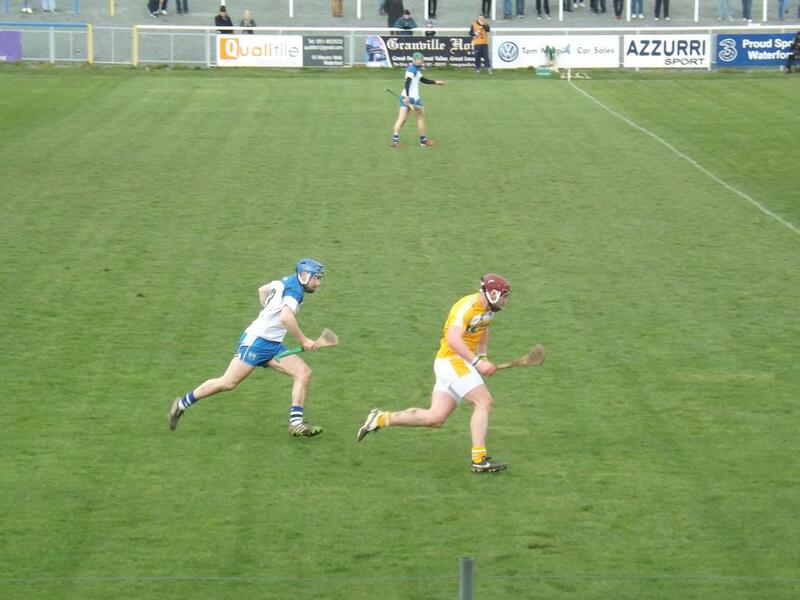 Waterford sauntered to the easiest of victories against poor Antrim opposition in Walsh Park today. Although last night’s shock result in Limerick meant that scoring difference became irrelevant for next Sunday’s showdown with Wexford, Waterford still put up one of the highest scores and biggest winning margins ever achieved by them at senior intercounty level. Wexford have also posted big scores in their last two games, including plenty of goals, so the challenge they pose will be on a different level from anything Waterford have had to deal with in their previous three games. On a fine but cold afternoon, Antrim had first use of the stiff breeze blowing towards the country goal, and dominated the early exchanges playing some well-drilled hurling and winning a lot of ball in the midfield area. However, once Waterford got out of second gear the tide turned against the visitors, eventually becoming a flood as the home side scored as they pleased in the second half. Stephen Bennett, making his first competitive start for Waterford, got his team in the mood when he blasted to the Antrim net midway through the first half following good work by Colin Dunford. Earlier, a good stop by the Antrim goalie kept another Bennett rasper out. Bennett then followed up with a couple of sublime points from out on the left. At halftime Waterford were 1-13 to 0-5 ahead and, with wind assistance to come in the second half, the game was as good as over at that stage. Waterford assumed complete control all over the pitch after the restart and did their bit to prevent the scoreboard operator from getting frostbite, as the points total rose remorselessly. A series of substitutions meant no respite for the visitors, with Maurice Shanahan in particular wreaking terrible destruction as he ran up 2-5 from play during the 20 minutes or so he spent on the pitch. Despite how easy things were going, Waterford kept up a commendable workrate, as the Antrim short-passing game repeatedly came unstuck. In a way, it was possibly unfortunate that Waterford, for the third game in a row, did not get a decent challenge coming up to the big game in Wexford Park next week. Virtually the entire team, including substitutes, can feel at least reasonably happy with their performances, but they will know that they were never put under the kind of serious pressure. Iggy Regan got no shot to save in goal while the fullback line completely snuffed out their opposite numbers, with Noel Connors again giving a master class in the left corner. The half back line were also in total control, with Tadhg de Búrca my man of the match at centre back. Up front, apart from Stephen Bennett’s excellent showing in the first half and Maurice Shanahan’s late blitz, Pauric Mahony landed five points from play in addition to six converted frees, while Jake Dillon also put in a hardworking shift. Colin Dunford was very effective operating in a free role in the first half, but the game seemed to pass him by when moved to left corner forward after the change of ends. By contrast, after a quiet enough first half, Brick Walsh became a dominant figure in the second half, notching what was, for him, an unusually large scoring tally of 0-3. Tom Devine also made a significant contribution when introduced. Waterford: Iggy O’Regan; Shane Fives; Barry Coughlan; Noel Connors; Philip Mahony; Tadhg de Búrca; Kevin Moran (0-1); Jamie Barron; Martin O’Neill; Colin Dunford (0-1); Pauric Mahony (0-11, six frees); Brick Walsh (0-3); Brian O’Halloran; Jake Dillon (0-2); Stephen Bennett (1-4). Substitutes: Shane O’Sullivan (0-1) for O’Neill; Maurice Shanahan (2-5) for O’Halloran; Paudie Prendergast (0-2) for Kevin Moran; Tom Devine (1-0) for Bennett; Shane McNulty for Connors. Other players named in programme: Stephen O’Keeffe; Michael Kearney; Gavin O’Brien; Shane Bennett; Thomas Connors; Donie Breathnach. 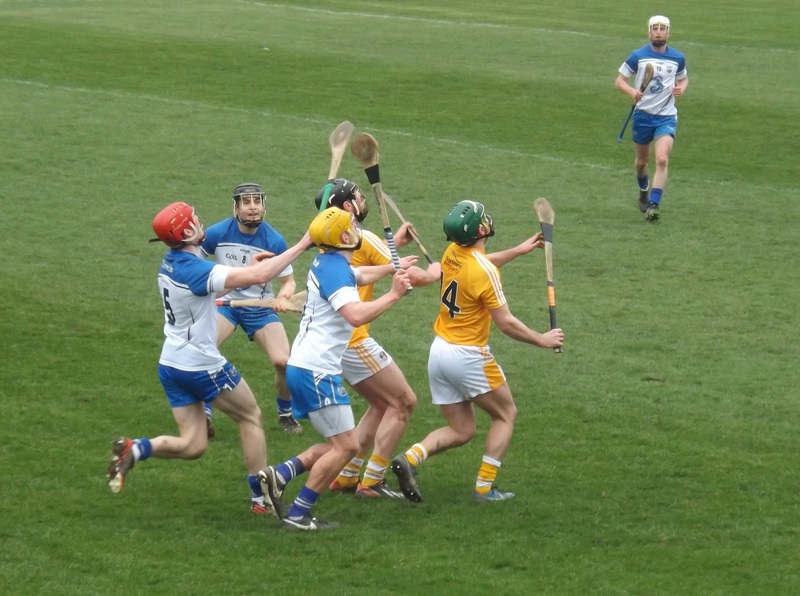 This entry was posted in Hurling, Match Reports, Waterford and tagged Antrim, Walsh Park on 15/03/2015 by deiseach. 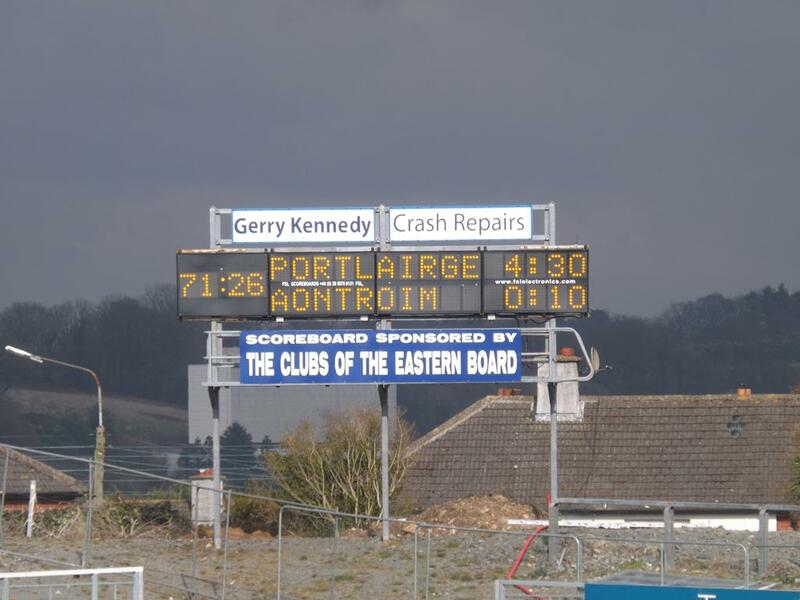 If memory serves me correct, back in 2008 there was a minor kerfuffle over the timing of Waterford’s clash with Antrim in Dungarvan. Antrim, not unreasonably, hoped the game would have an earlier throw-in so they could get back home at a cilivised hour. The GAA were having none of it. All matches started at 2.30pm on Sunday with exceptions granted only in extraordinary circumstances. Whatever became of that edict? I ask, not because of the 12.45pm throw-in today (which makes perfect sense given the double header, on which more of anon), or because of a demand for consistency (ad hocery strikes me as being more in keeping with the nature of the Association than giving into the hobgoblins of small minds), but because it can be tricky to keep track of what is going on around you. How many people were unaware that Waterford played Offaly last weekend at 3pm on a Saturday, a start time with an oddly Lutheran feel to it? I know I was unaware that Offaly were playing Limerick last night, which meant it was a minor, if pleasant, surprise to find the Biffs Faithful had lowered the colours of Stab the Broken Treaty City. It only makes a small difference to Waterford’s promotion prospects. Rather than needing to win both games, three points will now be enough. While I doubt that anyone goes out with the intention of drawing a hurling match, a small difference is better than none at all. And while I’m hesitant to say that any team ever succumbs to complacency in advance of a match – it was surely losing a man after only a couple of minutes that proved to be Limerick’s undoing rather than a smug belief that they were going to roll Offaly over – it’s no harm to be reminded that this game still needs to be won. Our last (only) loss at home to Antrim in the League was in 1985. If none of the current Waterford team are likely to remember that game, they should remember the abyss into which it proved to be the signpost. Speaking of good records, an unbeaten one goes on the line at 2.30pm – mine watching the footballers in the League. Yes, I have never seen Waterford lose an NFL match. The proud record reads W0 D1 L0, a draw with Limerick in the late 90’s in Stradbally. Or was it the early 00’s? I was expecting better things from the Waterford footballers this year. The least they can do is give a dig out to such a stalwart follower today. This entry was posted in Football, Hurling, National League, Waterford and tagged Antrim, Walsh Park on 15/03/2015 by deiseach. Jude McCurdy brought away in ambulance as #Deise v Antrim game was brought to early conclusion. Let’s hope he’ll be fine. Thankfully it looks like Jude McCurdy is going to be okay, and that’s what matters above everything else. With regards to the game, as with the Seniors and their damned-if-you-do win over Westmeath the scale of the win was at the high end of what we would have hoped for from the game. One thing we could have lived without was a small sliver of uncertainty about the final outcome. I’m not joking here. Last week we saw Cork make an appeal against Pat Horgan’s red card in the Munster final. This should have been a slam dunk. Having being instructed to apply the rule book, James McGrath applied the rule book. Yet inexplicably a judgement came out which allowed Horgan to play. There was a tiny part of me waiting for some ill-fitting suit in a smoke-filled commitTEE room to decide that the precedent had been established in 1998. Any game that finishes early must be replayed. Waterford were 20 points up and Antrim had conceded? Doesn’t matter. Any game that finishes early must be replayed. While this scenario was highly unlikely, it would not have surprised me at all. I’m tired. I’m paranoid. Sleep would be nice, but then I’d probably dream about Colin Lynch . . . 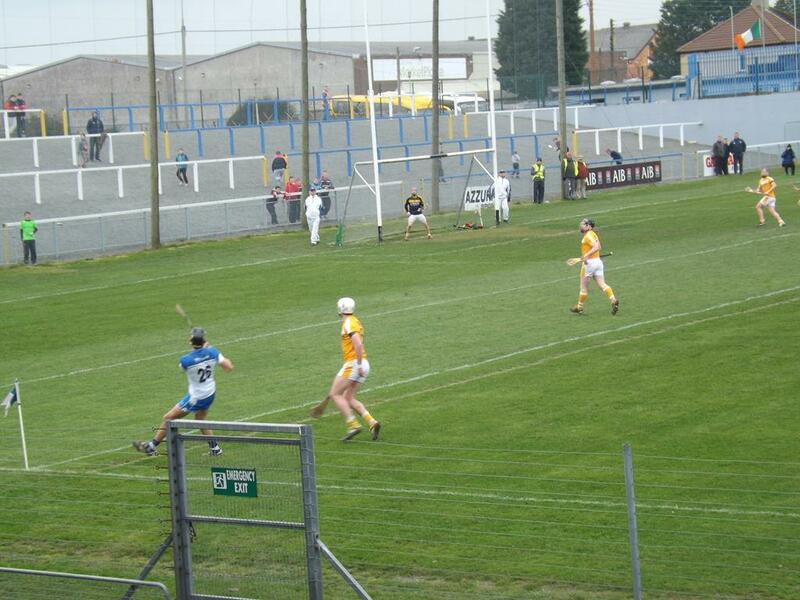 This entry was posted in Hurling, Waterford and tagged Antrim, Minor on 30/07/2013 by deiseach. Frank Abagnale Sr: You know why the Yankees always win, Frank? Frank Abagnale Jr: ‘Cause they have Mickey Mantle? Frank Abagnale Sr: No, it’s ’cause the other teams can’t stop staring at those damn pinstripes. Much later in the film Catch Me If You Can, Leonardo Di Caprio’s Frank Abagnale Jr is trying to spin his father’s line on the awesome power of the aura surrounding the New York Yankees to Carl Hanratty (Tom Hanks). Hanratty is unmoved. “The Yankees win because they have Mickey Mantle”. For evidence of how correct he is over those who invest so much in the benefits of mystique, you only had to look at Kilkenny finally succumbing to a well-placed stake through the heart. It’s no disrespect to Walter Walsh to say that he is not Eddie Brennan. Seriously, it is not disrespectful, few players in the history of the game are up to Eddie Brennan’s level. Take a player of the calibre of Eddie Brennan/Mickey Mantle out of your team and it doesn’t matter whether the stripes are of the black-and-amber or pin variety, you’re going to be weakened. Brian Cody has been deftly weaving new players into the pattern for over a decade now, but the longer you go the more likely the probability that your new weave will unravel, and so it happened yesterday. If you were only getting your hurling from the sages of The Sunday Game though, you’d have to believe that what happened yesterday was inexplicable. Even someone as unversed in the dark arts of hurling as myself could see the Cats were in trouble. They squeaked past Offaly, got beaten at the second attempt by Dublin, something you never ever do, beat a Tipperary team that has now lost three Championship games on the bounce, and let slip a five-point lead in the space of eight minutes to a Waterford team that never ever gives Kilkenny a game. How much more evidence do you need that Kilkenny are not the force they were? Yet before the game you had Michael Duignan blithely asserting that they were back in the groove. Based on what? Yes, they showed some composure in the extra-time against Waterford. But that was against a team that had put ninety minutes of effort into seventy. Every close shave was not proof that there were weaker, it was proof that the other teams couldn’t stop staring at those damn stripes. However, this was nothing in comparison to the post-match blarney. Surely in the aftermath of the fourth game this year where Kilkenny were not ahead after seventy minutes, there would be some acknowledgement that the facts of hurling had now changed. Instead, Cyril, Liam and Tomás behaved as if the result had been but a flesh wound. The red card had been decisive, the ref lost control, he made several decisions which aided Cork. Such focus on the ref allowed them to pretend that if they were to play again in the morning, Kilkenny would bounce right back. It was as if they were afraid that if they were suggest that the Kilkenny juggernaut had finally run out of fuel, they’d come right back at you and prove you wrong. Because that’s what Kilkenny do, they prove you wrong! Except they can’t. They can’t come back and prove you wrong. That’s because they’re out. There might be something to be said for not dumping on a great team, but there were times when I thought Liam Sheedy might burst into tears. Come on, pundits. We’re entering a scary new world where Kilkenny were not all-conquering and you won’t be able to fall back on predicting them to win to show how wise you are. Embrace it. You might even enjoy it. I know I will. 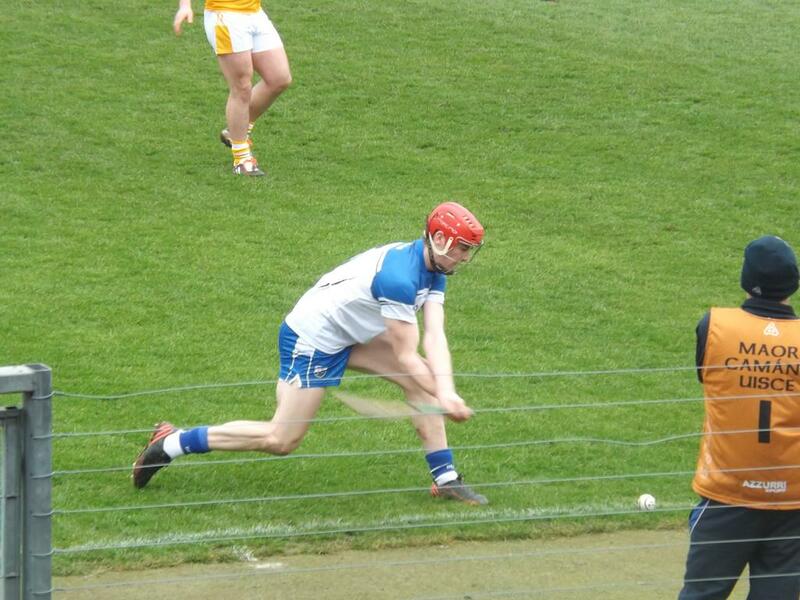 This entry was posted in Hurling, Waterford and tagged Antrim, Cork, Minor on 29/07/2013 by deiseach. The recent revelation, dissected by Shane Stapleton here, that Antrim had to race around the parish county kicking people out of bed to field an Under-21 team, should lead to a lot of hand-wringing about the championship – and that’s even before you consider the beating that the Glensmen took, a cringeworthy 32nd defeat at this stage, two of them against Waterford. Much and all as I like to whale on Antrim and their sense of entitlement, in this case the problem can be laid squarely at the door of the competition itself. There must have been something in the water at one of the Congresses in the early 1960’s as both the inter-county Club and the Under-21 championships began in 1964. And both, in what must be a coincidence, have remained mostly impervious to tinkering with the format, the introduction of an All-Ireland series in the early 1970’s in the Club championship and a change in the way semi-final line-ups were decided in the early 1990’s in the Under-21 championship (something we’ll come back to in a moment) being the only obvious changes to the way each one works. Of the two, it is the Club championship that has the air of something that, if it didn’t exist, you’d have to invent it. It slots neatly into the fallow winter period when there’s not much else on in the GAA, doesn’t put an annual imposition on each team (with the exception of Crossmaglen Rangers) and now that the Railway Cup is effectively no more the Club title has found an iconic place for itself in the GAA calendar. With all that in mind, it’s amazing no-one thought of it earlier. Oh hang on, they did – right at the birth of the Association, when clubs represented counties. Maybe Thurles Sarsfields should ask for their 1887 triumph to be added to the All-Ireland Club role of honour. The Under-21 championship, on the other hand, has no such claim to obviousness. There was already a perfectly decent underage competition, the Minor championship dovetailing neatly with rhyme and rhythm of its Senior counterpart. It doesn’t have any obvious place in the calendar, the neat solution in football of running it before the Seniors swing into action not being advisable in hurling with its requirement for drier pitches. Then there’s that format. The age-old problem of teams like Waterford putting in the hard yards on the training pitch only to be mown down in their first match persists in the Under-21. And at one stage in the 1990’s we had the utterly ludicrous situation where the champions of Munster and Leinster met every third year, effectively giving Galway a bye into the final – how many matches have Antrim lost in the history of the competition again? The ludicrousness of that situation was in no way compounded by Waterford being stuffed by Kilkenny in the 1994 semi-final. Such a suggestion would be, uh, ludicrous. Yet the Under-21 championship has one thing going for it – so many of the matches are utterly brilliant. Thanks to TG4, those of us who are not in the habit of traipsing up the country to see teams other than Waterford (or, to be truthful, even to see them – I’ve been to a total of three Under-21 matches) can now see the games as a matter of routine, and they rarely let you down. Losing to Clare in the 2009 Munster final was disappointing, of course. But it was heartwarming to see the joy on the faces of Clare supporters as they landed the Munster title after twelve defeats in their previous twelve final appearances. Although not as heartwarming as the simple displays of congratulations offered by so many of the Waterford supporters that evening. The hatchets of 1998 were well and truly buried that evening thanks to a competition that is important – but not that important. Then there was this year’s Munster final between Limerick and Cork. It was breathtaking, two teams going at it hammer-and-tongs like two prize-fighters where victory would only be declared to the last man standing rather than who was ahead on points at the end. Two things came together to make it such a classic, and they both run through the competition as a whole. You have two teams of players who have the vigour of youth but are all shaving at this stage. With the best will in the world, Minor teams do sometimes look minor enough to be banned from Gary Glitter contests. Then there’s the despair-inducing one-defeat-and-you’re-out system. Despite being a long-standing advocate of the back door, I’m not labouring under the delusion that nothing has been lost with its introduction. The relief that you won’t be out if you lose your first game is tempered by the knowledge that if you win the other lot are still in it. Beating Cork or Tipperary just isn’t the same these days, unless it’s in Croke Park. And that dreadful dichotomy lives on in the Under-21 championship. Long may it continue to beguile and bewitch us with its promise. One final thought. Louis Van Gaal, when asked whether winning the 1995 European Cup was the highlight of his career. He said that the first time was always the best, so winning the Uefa Cup in 1992 was sweeter. And for me, the Under-21 championship will always be the first. This entry was posted in GAA, Hurling, Waterford and tagged Antrim, Through Gritted Teeth, Under-21 on 14/12/2011 by deiseach. Kicking people when they are down is never nice, but it’s doubtful that anyone is kicking themselves harder at the moment than the Waterford footballers. For years in both League and Championship we were grateful to Kilkenny for keeping us from the very bottom of the pile. Then something curious happened in 2008. Waterford put together a few wins in the League. All other things being equal, Waterford would have been promoted from Division 4 but for a last minute Tipperary goal. Now, all other thing are not equal and it is unlikely Waterford would have played with the same amount of joie de vivre that saw them beat Antrim in the last round had promotion been at stake. But it was clearly an improvement, and it’s been matched by some excellent performances this year in the League. To recap: in the League we can compete with Tipperary, now a Division 2 side, and Antrim, this year’s Ulster finalists. So why do things go so badly wrong in the Championship? In 2008 we lost to Clare who had finished way down Division 4 and beaten in the 2007 Munster championship. This year saw a limp performance against Cork followed by a massacre from a Meath team who haven’t being pulling up trees recently. Why do things go wrong? Buggered if I know, but something clearly ain’t right. This entry was posted in Football, National League, Waterford and tagged Antrim, Clare, Meath, Tipperary on 08/07/2009 by deiseach. The 2009 All-Ireland hurling championship starts this weekend, and the marquee game is unquestionably the one in Thurles between Tipperary and Cork. The more interesting one though for those of us who obsess about how the GAA is run is in Portlaoise between Laois and Galway. Taking place at the time of writing, you don’t need to be Nostradamus – or even someone could really predict the future – to see this one is going to end badly for my wee nephew’s county. Still, the prospect of seeing Galway in the mainstream of the championship as opposed to standing outside demanding the mainstream divert itself into their path is a positive development. This isn’t a cut at the Leinster championship. It is self-evident that the Leinster title lacks the allure of its Munser counterpart, but this isn’t because of an inherent lack of competitiveness – indeed, if lack of competition were a reason to denigrate a tournament, we wouldn’t be bothering with the Liam McCarthy Cup itself. It’s that for those of us willing to defend the centrality of the provincial championships in the All-Ireland series, the absence of Antrim and Galway was a glaring anomaly that needed to be addressed. I’m unconvinced that any open draw system will make the hurling championship ‘work’. People talk of Champions League-style group stages, but we had that a few years ago in the qualifiers and it was not a success. Waterford whipped the mid-ranking teams then had their fate decided by their efforts against Clare (an away defeat) and Galway (a home win). However devalued the provincial championships might have become by the back door, and there is no point in pretending that there has been no devaluation, there is still a frission of tension generated by competing for trophies with a century-old pedigree. It would be hard to retain any of that in a round-robin format, and the amount of dead rubbers will reach Ireland-Davis-Cup-match proportions. Of course, that’s not to say the provincial championships are inviolate. If they are so damaged that they can’t be fixed, it would be time to replace them. Even the Railway Cups had to put out of their misery. Hopefully the fix getting its first run today will prove sufficiently robust to keep these venerable old competitions on the road. This entry was posted in GAA, Hurling, Munster, Waterford and tagged Antrim, Clare, Cork, Galway, Laois, Leinster, Munster, Tipperary on 31/05/2009 by deiseach.